“According to NOAA, plastic debris kills an estimated 100,000 marine mammals annually, millions of birds and fishes. The largest pieces of marine plastic debris, miles long discarded fishing nets and lines mostly, take an obvious toll on animals. 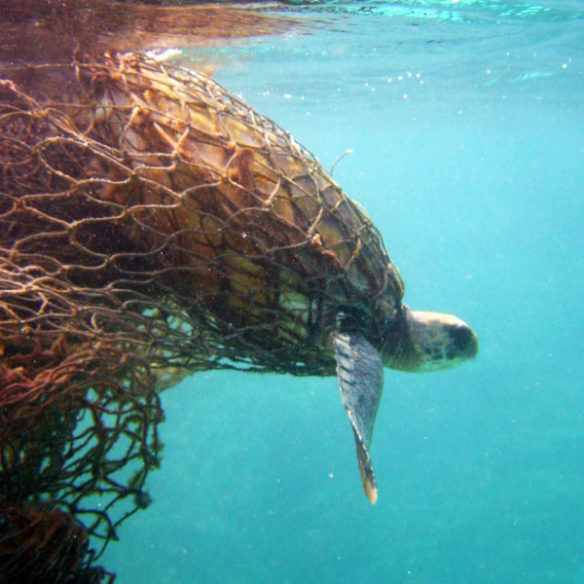 These derelicts nets, called “ghost nets”, snare and drown thousands of larger sea creatures per year, such as seals, sea lions, dolphins, sea turtles, sharks, dugons, crocodiles, seabirds, crabs, and other creatures. Acting as designed, these nets restrict movement causing starvation, laceration, infection, and, in animals that need to return to the surface to breathe, suffocation.” —Captions: © SAF — Coastal Care.